London in the 1960s was the focus of a new culture of self expression in fashion, music, theatre, cinema, art and design. Red buses, black taxis, mini skirts, mini cars and houseboats on the Thames were all widely-recognised symbols of the London scene. And the accompanying search for a liberated lifestyle spilled over into architecture and engineering. At London's Architectural Association School of Architecture (the AA), the group called Archigram (1961-75) provided the seeds of change from which the High Tech movement would emerge. Also at the AA was influential architect Cedric Price (1934-2003). He was working closely with engineer Frank Newby, Hunt's erstwhile colleague at FJ Samuely & Partners. It was a time of experiment, daring and adventure. There was a desire for newness in urban design, architecture and engineering  a desire to leave the past behind and embrace the future. There was also a lot of interest in designing loose-fit adaptable buildings, and temporary ones too. Having acquired considerable experience with lightweight structures, Hunt was uniquely positioned to give professional credibility to what were impressively presented but as yet untested structural concepts. In August 1962, Hunt founded the engineering firm Anthony Hunt Associates (AHA). The move was made partly out of necessity, as his employment at Hancock Associates had ended abruptly in July of that year. Hunt had kept up his good relationship with Frank Newby, who was by now head of FJ Samuely & Partners and teaching at the Architectural Association. Newby provided sub-contract work to AHA, which kept it going in its early months. Hunt's time working at FJ Samuely & Partners, where the engineers collaborated with various Modern Movement architects, provided him with introductions to other Architectural Association members. Hunt also met, and was influenced by, leading American and European architect engineers, including structural engineer Konrad Waschmann, industrial designer Charles Eames (1907-78), pioneering thinker Richard Buckminster-Fuller (1895-1982), furniture designer Fritz Haller and designer Jean Prouvé (1901-84). Working jointly with the emerging generation of British architects  which included figures like Norman Foster (1935-), Richard Rogers (1933-), Michael Hopkins (1932-) and Nicholas Grimshaw (1939-)  Hunt helped pioneer the lightweight, prefabricated, component-based style of British architecture that came to be called High Tech. He was able to provide the mass-produced highly-engineered components, produced using industrial processes, which contributed to the architecture these visonaries wanted to achieve. The first of these industrialised designs by AHA (pre High Tech) was the structure for the library at Leicester University, designed by architects Castle and Park. The system AHA came up with was code-named 'Structair' and was intended to be an off-the-peg product. It consisted of hollow beams and columns that doubled as ductwork for a stack ventilation system. Unfortunately, the project was abandoned (although it was subsequently built to a similar design), temporarily throwing AHA's finances into turmoil. Another significant early commission was the Alexandra Road housing project in north London, commissioned in the late 1960s and completed in 1978. With project architect Neave Brown (Camden Borough Council), Hunt engineered an uncomplicated standardised concrete structural system, unitised to create a single terrace, 300m long and seven storeys high. Other commissions followed, such as the Reliance Controls factory in Swindon  a Team 4 project that set new standards in British industrial architecture. But the definitive moment for Hunt was his collaboration in 1971 with Foster Associates (which by then included Michael Hopkins) in a temporary office building for the computer company IBM  IBM Pilot Head Office  at Cosham, Portsmouth. IBM wanted a large single storey open plan space designed to last about seven years. Hunt engineered a large but uncomplicated, cost effective post and lattice beam structure, prefabricated using batch-produced components. The building is still in use after more than 30 years. Through the '60s and '70s Hunt continued to work on component-based structures. By the end of this period, he was principally working in association with Michael Hopkins, who shared his interest in furniture and yacht design. They developed the building system called SSSALU (short span structures in aluminium). Its components were all made of extruded aluminium, with yacht rigging elements used for cross bracing. The system could be configured to make various kind of structures. 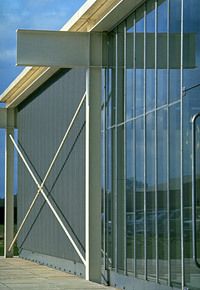 The Patera relocatable building of the early 1980s, designed by Hopkins, was a larger version of the same concept, made in steel and intended mainly for uses such as small workshops. Hunt proved an ideal collaborator for the architects who emerged from the swinging '60s and headed for High Tech. Drawing on '60s ideas such as the instant village, plug-in design and the virtues of transience, they shaped a sophisticated and cohesive approach to building design and construction in Britain. Anthony Hunt (left) with fellow AHA engineer Richard Clack at Alexandra Road housing (late 1960s - 1978), at Swiss Cottage in London  designed by Sidney Cook, head of Camden Borough Council Architecture Department. 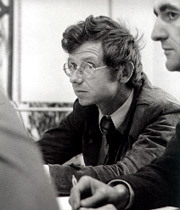 The project architect was Neave Brown, who was instrumental in AHA's appointment. The Reliance Controls factory (completed 1966), Swindon, designed by Team 4 (which included Richard Rogers and Norman Foster). Considered the first High Tech building in the country, it was also the last project worked on before the break-up of Team 4. IBM's Pilot Head Office building (completed 1971), at Cosham, Portsmouth, Hampshire. The interior of the IBM Installation Support Centre (IBM) at Greenford, Middlesex.